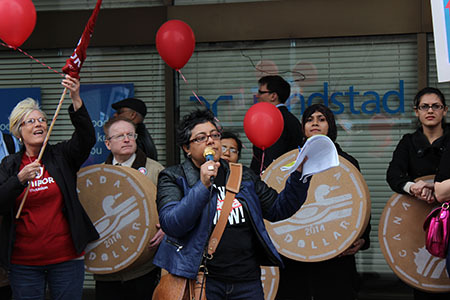 Along with actions across Ontario, members of the Workers Action Centre were prominent participants in the Toronto rally, and helped to make the links between decent wages and decent work. 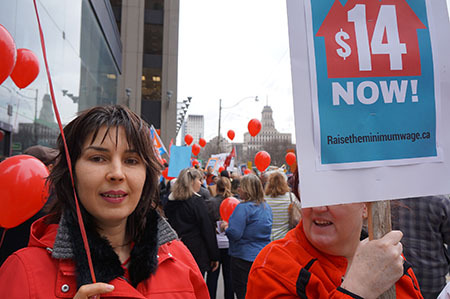 In Toronto, nearly 200 people rallied downtown demanding a $14 minimum wage and decent work instead of precarious, low-wage employment. The crowd then marched north on Bay Street to a Randstad office. Randstad is the second largest temporary help agency in Canada and around the world. 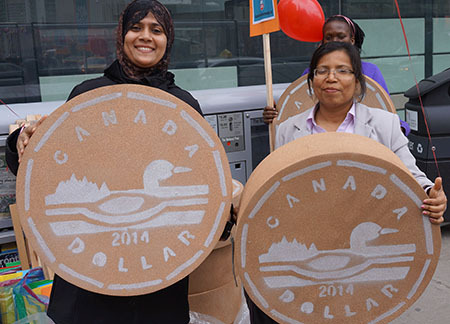 WAC members were instrumental in the action, carrying placards and handing out flyers, balloons, and gold chocolate coins to symbolize the gap between the current $10.25 minimum wage, the promised $11 minimum wage and the needed $14. Many of the passers-by stopped to join the rally. 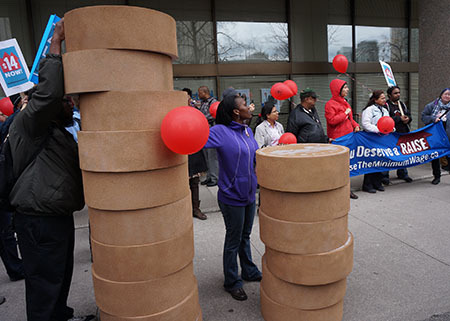 WAC members carried over-sized Styrofoam loonies to highlight the 40% in lost wages experienced by temp workers. 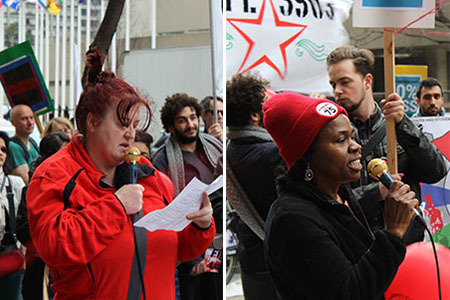 At the rally, WAC member and former temp agency worker Lorraine Ferns addressed the crowd with a rousing speech explaining why workers need a $14 minimum wage now and why temp agencies must be further regulated, as part of a decent work agenda. For every $10 earned by directly-hired workers, temp workers earn only $6, even though they do exactly the same work. This wage gap accounts for the nearly $6 billion revenue that is diverted annually from Ontario workers, toward the corporate coffers of the temporary staffing industry. 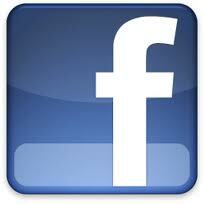 Nationally, this gap helps generate a revenue stream of $12 billion annually. 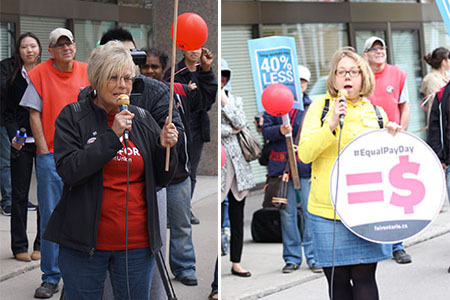 Retail worker and UNIFOR member Sue Holdaway and OPSEU member Laura Thompson addressed the crowd and highlighted the connection between raising the minimum wage and pay equity. 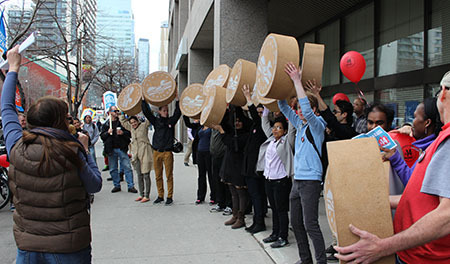 This was just one event in a province-wide day of action! 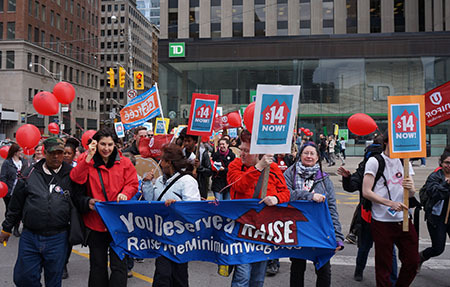 Here is a round-up of actions and media coverage from across the province compiled by the Campaign to Raise the Minimum Wage.